Have you ever wondered what it would be like to start a family without a place to live? This is the case for so many families as they are forced to live with parents or hop from borrowed home to borrowed home in hopes that some day, they’ll have a home of their own. This ministry helps those families get started and is used as an evangelistic tool to reach out to the community. Change a needy family’s future by helping to provide a home and freeing up finances for food, education and healthcare. We take care of the logistics and you provide the labor. 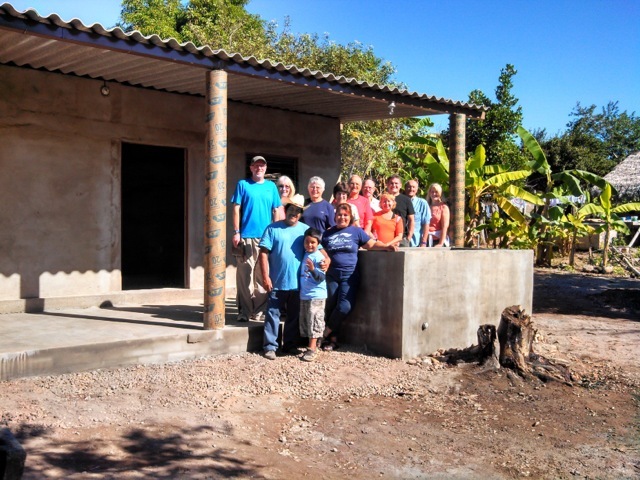 Join us for a Dwellings house build! This 600 square foot house serves the basic needs for our local families. 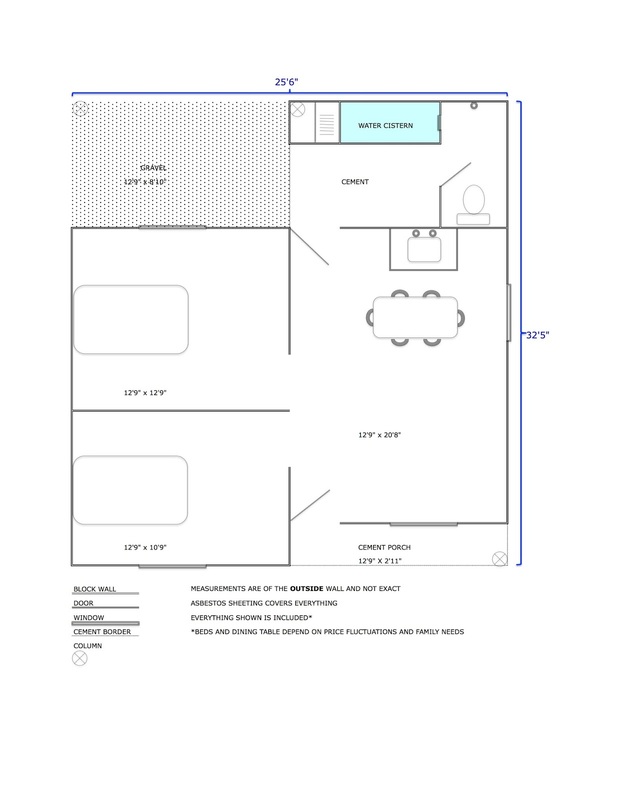 It has a small three foot porch in the front, two bedrooms, a living room with a kitchen and dining area, a bathroom and a water cistern with a washboard and counter in the back, and an open section in the back that will have a gravel floor. We build our own cinder blocks in advance that fit together like legos. After strengthening the walls with columns, cement, and stucco, the roof is put on. 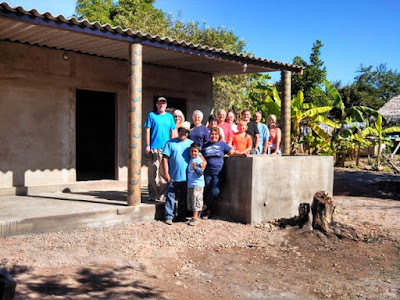 With the floor, septic, and water cistern built before the team comes, this house can be done in one week with a group of 10 adults. Fermín Ballesteros-Lucas and Carolina Solís-López, both of Cofradía, have two children: Diana and Alexis. This couple has been together for nine years. 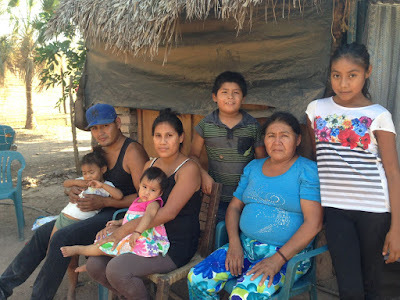 Fermín is a temporary laborer working in anything from the fields to construction, but because of the scarcity of work in the area, they have been unable to save enough money to build a house, which has forced them to move from borrowed house to borrowed house. They comment that the majority of the time, owners arrived asking them to move out as soon as possible, many times giving them only 24 hours. This has caused them a great deal of difficulty because they have to find another place to live with very little time to search for something more permanent. They say this has been one of the most difficult experiences their family has had to endure, especially for the children. 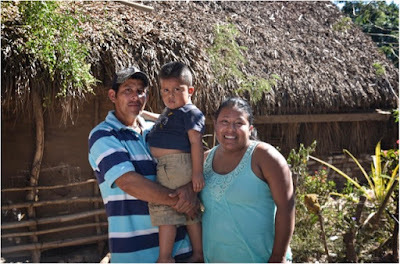 Last year, Fermín was finally able to buy a plot of land together with their brother-in-law, Goyo. They dream of one day having their own, permanent home there, where they no longer have to bother anyone else. Zeferino Carillo-Matías and Jesús Lopez-Vázquez have four children and currently work as field hands only for two or three months every year in order to support their children. When they travel to find work, the children have to stay with Jesús’s mother. This is because the children are young, and the home where they currently live is unsafe. They don’t want to risk anything happening to the children. In addition, Zeferino works in Tepic (about an hour and a half from Cofradia) when he can, helping with construction. This kind of work does not provide sufficent income to make improvements on their home. During the rainy season, they have to find somewhere else to stay because their roof leaks so badly. 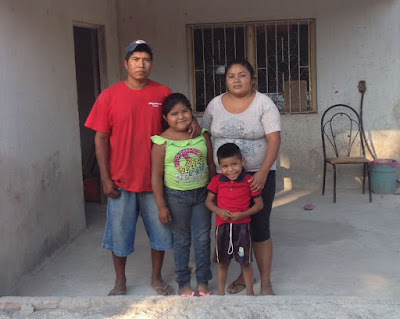 They are seeking God’s provision of much more work in order to provide a better living situation for their family. In other words, they are waiting on a miracle. 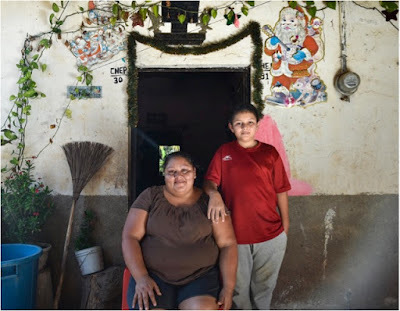 Diego Martinez from Las Pilas and Sandy Partida from Cofradía live in a borrowed house in Las Pilas. This young couple has been together for 11 years. They met while working in the fields planting melons. Sandy was interested in Diego and wanted him to ask her out. She remembers watching other young ladies flirt with Diego, so she decided not to wait and asked him out, instead. The couple dated for four months before moving in together. Now, Diego cares for cows and repairs fences, and Sandy makes and sells cheese during the rainy season. They really want to have children and are seeing a doctor who is helping them with their fertility struggles. The couple has lived in the borrowed house for five years, and they are ready to feel the security that comes with knowing they are in a home of their own. 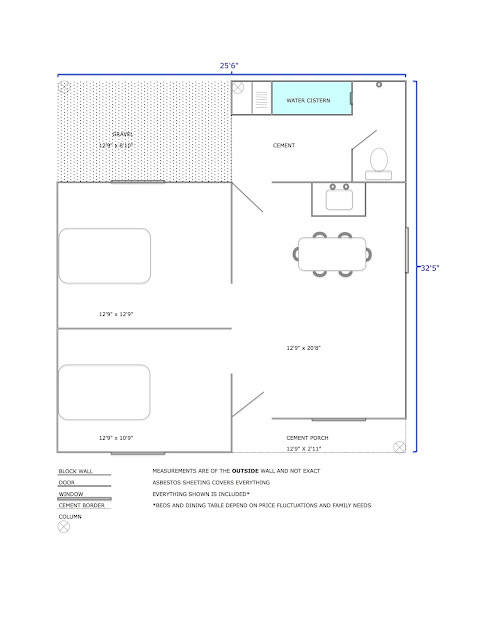 This home would also be a place where they would start their family and raise their children. Modesta has no husband, so Goyo has taken on the responsibility of caring for his mother and nephew in addition to his own family. At this time, he works as a brick layer, earning enough to cover the cost of food and some of their necessary expenses, but that is insufficient for building a house. 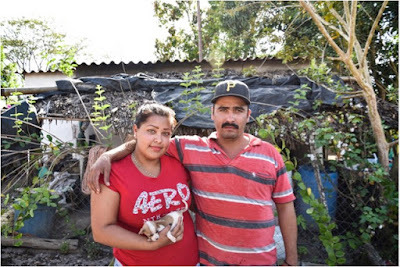 After expenses, they have only been able to save enough to purchase just half of the parcel of land where they one day hope to build a house. They currently live in a borrowed house. Rafaela says it is difficult knowing that at any moment the owners could require the house again, leaving them without a place to live. Having their own home would provide a long-desired sense of stability for their family. María Vázquez is a hard working single mother raising her young son, Eric in the nearby town of Santa Fe. When she was younger, María worked in Ruiz where she met Eric’s dad. He moved to the United States, and later María and Eric moved there to be with him. It didn’t work out for them, so María and Eric moved back to Mexico and stayed with her sister. However, when her sister’s husband returned home, they had to move out. She rented a house for a while, but it was very difficult for her to make the payments with money she earned selling meals. When her brother and his family moved to Cofradía, they loaned María their house in Santa Fe. Everyday, she worries that her brother will need his house again, and she and Eric will be asked to move. For her, having a home would mean happiness, peace and the security of having a place of her own where she knows she would never be asked to leave. José Vázquez and Silvia Martinez are raising their young son, José Alexis in the nearby town of Santa Fe. The couple met in Chihuahua where José was working in orchards picking apples and peaches. Two years later, Silvia came to work in the same fields, and José fell for her right away. After dating for five months, the couple moved to Santa Fe where José now works in the nearby fields, and Silvia cares for José Alexis. 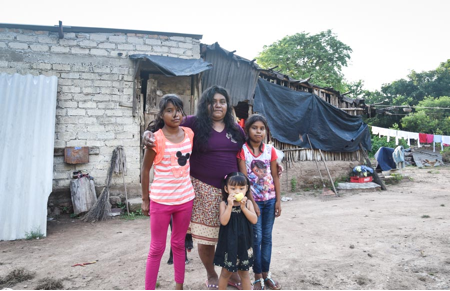 The family lives in a home they are borrowing from José’s parents. The house floods during the rainy season. The couple remembers a particular rainy season two years ago. Their son was sick and after being exhausted from caring for him all through the night and taking him to the doctor the next day, they were so tired that they slept through the rain and didn’t notice the water coming into the house. When the neighbors came to wake them, their clothing, furniture, bed and other household items were soaked. For this family, having a house would mean having the security of being in a home of their own on their land. It would also be a safe place for them to live that wouldn’t flood every year. and help change their life. and reserve dates to build a home.